Plans for the multi-million pound regeneration of a canal are being shown to the public. People in Bude are invited to bring their old photographs and memories to add to the exhibition. 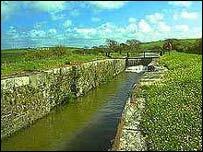 The Bude canal system is considered to be of historical importance because of its incline planes, tub boats and a unique sea lock system. One of the reasons the 35-mile long canal was built was to give work to men coming home from the Napoleonic wars. To secure financial support for project in the 19th Century the engineer, James Green, told local landowners the canal would enable them to bring lime rich sand to the poor inland soils. Now millions of pounds are being invested in the restoration of a two-mile stretch of the canal. The public are being asked to give their views on plans which are being funded by a variety of agencies including the Heritage Lottery Fund and Objective One.